Wisconsin head coach Bo Ryan. 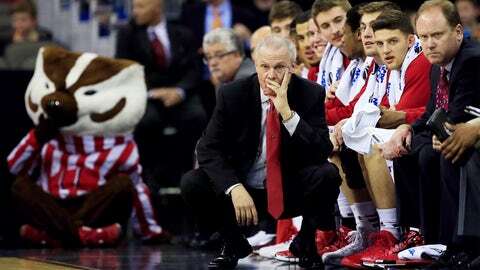 Wisconsin’s Bo Ryan still is not ruling out coaching next season. Ryan says he has not made up his mind. Ryan announced in late June that he planned to retire after this season. But he left the door open to staying on beyond that in August when he said he was ”not totally sure” if he would step aside. On Thursday at the Big Ten’s annual media day, he said he is keeping that door open. Ryan led Wisconsin to back-to-back Final Four appearances and took the team to last season’s national championship game, where the Badgers were defeated by Duke. He has posted a 357-125 record in 14 years at Wisconsin.